This Christmas the handmade gifts were few as our family was unpacking a house, getting sick, finishing up the end of a long semester, and writing an e-course but I did manage to sneak a big one in there with the help of my SIL, Brittany. 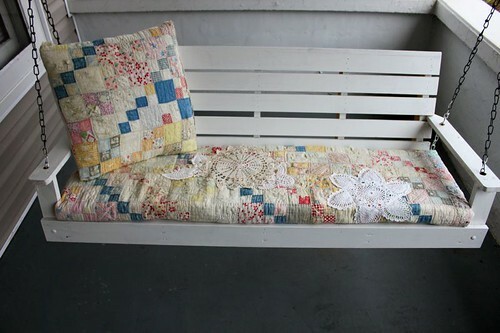 She and I both knew her mom would love a seat cover for her front porch swing made from an old cutter quilt. Brittany didn't have time to fix it up and I didn't have a quilt to fix it up with and we soon realized this needed to be a joint effort. With the assistance of my BIL, Grant, we were able to get the exact measurements of the swing. I had some foam on hand from a stalled project, a pillow form I no longer used in the kids' room, and a few doilies leftover from an earlier tutorial that I used without having to spend a thing. As you can see (and maybe I'm a little worried that some of you quilt lovers are still going to hate me for cutting into this!) 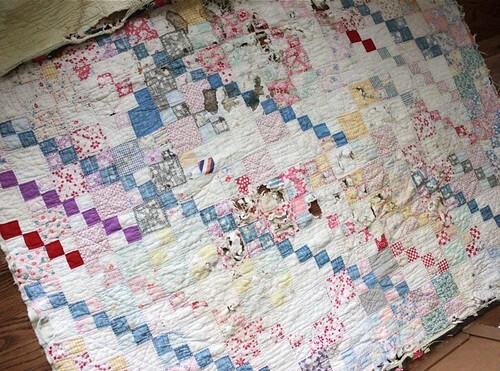 the quilt had been well loved to the point that there were dark stains, worn edges, and holes in a few spots. I stitched it to a cream drop cloth to fill in the holes from underneath and give it a little more strength. I then covered up the holes with well positioned doilies and created a flower-like shape to extend coverage without it looking too random. I created a pillow case effect with the quilt by folding it in almost thirds (not quite all the way over on the back) and box stitching the ends to allow a nice shape for the foam insert. I then stitched ties on the bottom for easy removal. I stitched up a simple pillow case from the same quilt using more drop cloth and a pillow form. Brittany set it up so that she'd see it on Christmas morning and Cheryl loves it! I love when a handmade gift turns out better than I had imagined and really hits the spot with the recipient! I didn't make my mom's gift but it was custom made by an online friend and I'd be lying if I said I wasn't a little thrilled that it made her cry when she opened it. It was a little more meaningful as it had to do with my brother's pending deployment and the few days we got to spend with him on his holiday pass before he heads out for awhile. 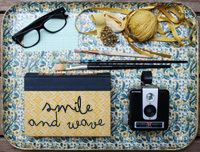 Were you able to give handmade this year? 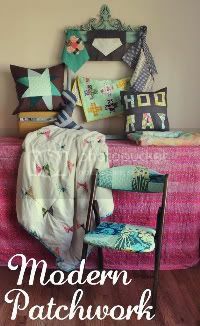 Did you surprise anyone with something they loved handmade or not? I hope you had a lovely Christmas and continue to enjoy the week before New Years! I'm hoping to plan something extra fun for our little family to do to ring in 2011 but we all know what happens to the best laid plans...someone gets pneumonia! AAGGH! i didn't hand-make anything this year (other than gifting a few of my own orig. prints. does that count?) but i did get my sis a yoshitomo nara book that just came out. and a living in japan for a year book that is beautifully illustrated. she is hoping to move to japan next summer. that seat cover and pillow are beautiful. hope ya'll have a lovely new year! This is so great! I love it...I think that you saved that quilt from being put in a closet since it was so well loved. that seat cover is so pretty! good job on it. 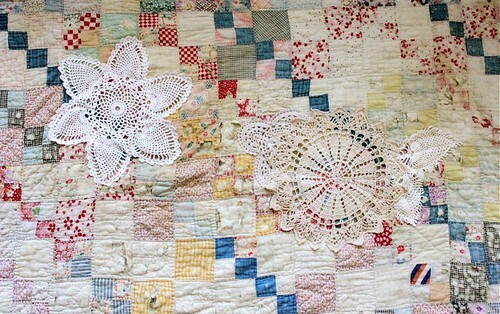 the doilies are a good idea to cover up stains. i made my boyfriend's father a paintbrush holder and his mom a knitting needle holder (essentially the same things with different measurements). i wanted to make a bunch of lavender/rice filled neck/hand warmers but didn't get around to it. i'm actually excited xmas is over so i can pull all the crafty stuff out again and maybe make them before spring comes. Great job. It's beautiful! I love all the fun colors and lace. I also found time to hand paint all the gift bags we used for wrapping. No one wanted to throw them away, so I ended up taking several back home to use for next year! But it was still an awesome Christmas. The cover and pillow look amazing. those are beautiful! I would buy that for myself any day if it were found in stores! My husband and i handmade nearly everything! we started this summer, let it dwindle off, then went to a mad rush right before christmas! we are running late on family gifts though, being a military family we have to post everything, i'm terrible with remembering to go to the post office! so adorable!! nicely done. what a thoughtful gift! Those are lovely! I made my BIL a terrarium with little clay mushrooms, a gnome, and a gnome house I made. He stared at it for a solid five minutes occasionally repeating "you really should sell these." I also made a pink polka dot hat and scarf set for my boyfriend's 5 year old sister. She requested I make her gift. Her response was, "I already have a winter hat." I guess you win some and lose some. i love this! my mom would love this on her front porch. looks great...i wish i had a swing. btw this was featured on www.whipup.net! this is so lovely, it makes me smile! 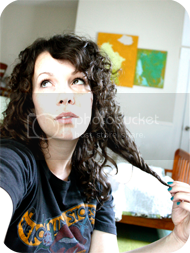 wow rachel, that is simply gorgeous!!! Beautiful! The doilies are a perfect addition. this is absolutely beautiful!! I love these sort of seats. You don't really get them here in England. 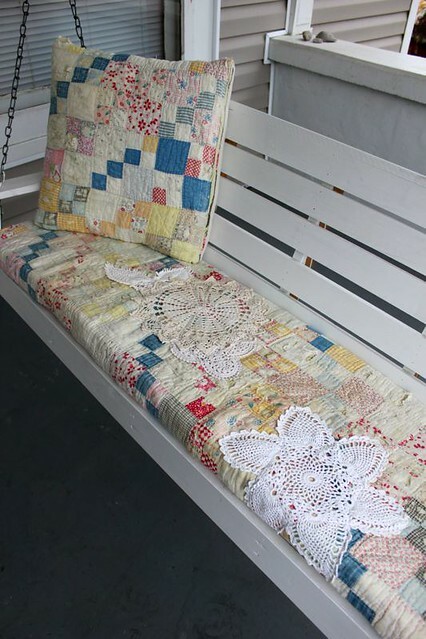 I want me a swinging bench and a beautiful quilt! What a great idea! I actually used your felt doll tutorial and made one for my 5 year old sister. I was worried with all the other presents she got it would be overlooked, but she LOVED it! I have to admit, I loved playing with it almost as much as her! Thanks for the wonderful gift idea!!! What a great idea! I actually did lots of handmade this year! A wreath for my sister in law, coffee sleeves for my nieces and homemade hot cocoa and homemade marshmallows to go in a few gifts. I always say I'm going to do more handmade, and this year, I finally made the time and did it. It was definitely worth it! Wow, this is seriously so, so beautiful. What a great idea! I bet she loved it! Just beautiful! I love it! I did a little handmade this Christmas. Mom helped me sew a couple of drawstring bags for my niece and nephew for their Christmas marbles. I also knitted a cowl for my sister and a pair of matching facecloths in organic cotton for my mom. Still working on my stepson's scarf--maybe for his birthday? What a super sweet handmade gift! I hope your Christmas was great!